The terms heliography and photography are nearly synonymous and during this article will be used interchangeably. The Greek helio- means sunlight whereas the Greek photo- means light. Heliography is the use of the rays of the sun to sketch out perfect pictures (sun pictures). The vast majority of 19th century pictures; calotypes, daguerreotypes, ambrotypes, melainotypes, albumen/collodion/platinum prints were taken using the rays of the sun and are examples of the heliographic art. It was only in the later days of the 19th century when photographs were taken by man-made light (flash light photography) that the term heliography could no longer be applied. The majority of photographs taken even today can be described as heliographs. Heliography revolutionized art in the 19th century. It was a blend of science and the arts that used the rays of the sunlight to produce images. In 1839, Daguerre published the process for producing daguerreotypes, but it took Yankee ingenuity to help move this process from an obscure new art form into the mainstream. Within days after Daguerres announcement, two teams (Samuel F. B. Morse & Professor John W. Draper, John Johnson & Alexander S. Wolcott) incorporated significant improvements to Daguerres process. The original daguerreotypes were constrained to photographs of inanimate objects (buildings, monuments, landscapes) due to the long exposure times required (~ 30 minutes). The Americans used optics to intensify the light and thereby shorten the required exposure time. This made portrait photography possible. Morse & Draper used a non-achromatic lens with a large aperture and a short focus, while Wolcott & Johnson used a metallic reflector of wide aperture for the lens. The Americans realized that the heart of this new art form could only be fully realized if it could capture the human form. By the early part of October 1839, these two teams had produced the "first human photographic portraits the world ever saw". 1 Their inventions lead to thousands of portrait galleries springing up almost overnight throughout America and Europe. New England played an important role in the evolution of photography. This is evident by the large number of photographic patents awarded to New England inventors. Refer to the attached Table in Microsoft Excel. Patent Number 2,522 On 28 March 1842, Benjamin R. Stevens & Lemuel Morse of Lowell, Massachusetts were awarded a patent for a process of coating daguerreotype plates with gum mastic varnish in order to protect the fragile surface of the daguerreotype plate thereby enabling color paints to be applied to the image. Patent Number 2,826 On 22 October 1842, Daniel Davis jr. of Boston, Massachusetts was awarded a patent for a process of color tinting daguerreotype pictures through electroplating. He assigned this invention to John Plumbe jr.
Patent Number 11,758 In 1854, Samuel Peck of New Haven, Connecticut was awarded a patent for manufacturing of daguerreotype cases. Ground gum shellac and dyed fibrous material were heated to form a plastic that was pressed into the mold to create a daguerreotype case. These cases became known as the Union Case or the gutta purcha thermoplastic case. Patent Number 13,106 In 1855, Albert Sands Southworth & Josiah Johnson Hawes of Boston, Massachusetts were awarded a patent for an apparatus for displaying moving stereoscopic pictures. Ten stereoscopic plates for the left eye were stored on one side of the instrument and the corresponding ten stereoscopic plates for the right eye stored on the other. A small hand crank and gears moved the plates into position and alignment with a polished right angle metal mirror for viewing. The device displayed three-dimensional moving pictures. Patent Number 19,626 In 1858, James Ambrose Cutting & Lodowick H. Bradford of Boston, Massachusetts were awarded a patent for improvements in Photolithography. They defined a process of created a very durable photographic picture on a lithographic stone. Patent Number 29,652 In 1860, Douglass F. Maltby of Waterbury, Connecticut was awarded a patent for manufacturing photographic campaign buttons. He assigned this invention to the Waterbury Button Company. His patent included a drawing of Abraham Lincoln sporting a thin mustache and a goatee (referred to as a soul patch) on a campaign button. Patent Number 34,800 In 1862, Allen B. Wilson of Waterbury, Connecticut was awarded a patent for a camera containing a built in dark room. The entire process of coating the glass plate with collodion, sensitizing the negative, exposing and developing the negative plate were all performed within this camera. Patent Number 83,545 In 1868, George K. Proctor of Salem, Massachusetts was awarded a patent for a photographic room. The room was designed in the shape of an elongated oval, which reflected light toward the center of the room. The room was lighted artificially through a magnesium flame. Photographs could be taken with a 15 second exposure, day or night. Patent Number 93,594 In 1869, O. B. Brown of Malden, Massachusetts was awarded a patent for an optical instrument. Brown described the instrument as combining a phantasmascope (or phenakistoscope) with that of a phantasmagoria (or magic lantern). The device was used to project moving pictures on a wall or screen. Patent Number 97,419 In 1869, Lorenzo James Marcy of Newport, Rhode Island was awarded a patent for a photographic printing apparatus. This device was a predecessor to the modern enlarger, which used a lamp to produce contact prints and contact magic lantern slides. Patent Number 141,351 In 1873, William Henry Hill of Worcester, Massachusetts was awarded a patent for the process of producing collodion prints on soft media including white wax, spermaceti and paraffin. Patent Number 145,296 In 1873, Warren Harris of Danville, Vermont was awarded a patent for a stereoscopic camera for taking pictures on ferrotypes or other opaque plates. On 16 June 1874, he was awarded two additional patents (Numbers 151,972 & 151,973) for right angle stereoscopic camera lenses. Patent Number 152,147 In 1874, Asa Messer jr. of Lawrence, Massachusetts was awarded a patent for a porcelain enamel ferrotype plate. Patent Number 197,534 In 1877, Lorenzo Wright of Pawtucket, Rhode Island was awarded a patent for an adjustable focus glass for camera-obscuras. This improvement allowed the actinic and luminous foci to be made concurrently. Patent Number 201,248 In 1878, Augustus L. Hudson, of Hingham, Massachusetts was awarded a patent for the concept of a film magazine. The camera design allowed a sequence of dry plate glass negatives to be exposed before the magazine (drop box) was removed for developing. Patent Number 231,506 In 1880, Isaac H. Stoddard of Ansonia, Connecticut was awarded a patent for a cable release to remotely trigger the camera shutter. He assigned the rights to his invention to E. & H.T. Anthony & Company. Patent Number 237,392 In 1881, William S. Laighton of Norwich, Connecticut was awarded a patent for a photographic headrest. More importantly, this patent encompassed innovative camera tripod design as well as surveyor transit & levels tripod design. Patent Number 240,374 In 1881, William Valentine Brigham, of Newton, Massachusetts was awarded a patent for producing combination negatives. This process has similarities to the techniques used in cell animation. In this process, a glass plate is coated with gelatin and then collodion. The negative is then exposed of the background scene, and after drying, the negative is peeled from the glass plate. The next step was to use a second glass plate negative and expose the foreground scene (for example, an individual against a backdrop of a plain dark screen). The background negative would be placed over the foreground negative and aligned and the outline of the individual would then be cut from the background negative. Patent Number 273,206 In 1883, Redfield B. West of Guilford, Connecticut was awarded a patent for non-silver based photographic paper. In this process the paper was sensitized using a bath of potassium bichromate, magnesium sulfate, and mercuric chloride and was developed using a bath of gallic acid, ferrous sulfate, aluminum, ammonium sulfate and sodium hyposulfite. The prints produced could range from black to brown and a method for producing reddish brown prints were included in the patent. Patent Number 286,447 In 1883, Benjamin W. Kilburn of Littleton, New Hampshire was awarded a patent for a photographic camera that incorporated a gunstock as a support. He assigned the rights of this invention to the Scovill Manufacturing Company located in Waterbury, Connecticut. Patent Number 299,289 In 1884, Charles W. Stiff of Foxborough and Nathaniel C. Bousley of Salem, Massachusetts were awarded a patent for a photographic camera incorporating an exposure timer (composed of a clock mechanism and a pneumatic device) that controlled the camera shutter. Mr. Stiff improved on this design with the release of a second patent (Number 336,356) on 16 February 1886. Patent Number 319,669 In 1885, John K. Beach of New Haven, Connecticut was awarded a patent for a high-speed shutter control that could take short duration exposures. This mechanism enabled photographing fast moving objects. Patent Number 337,703 In 1886, Samuel Powel of Newport, Rhode Island was awarded a patent for a chemical process that converted the blue in cyanotypes (also known as "iron pictures" or "blue prints") into black or other dark colors. 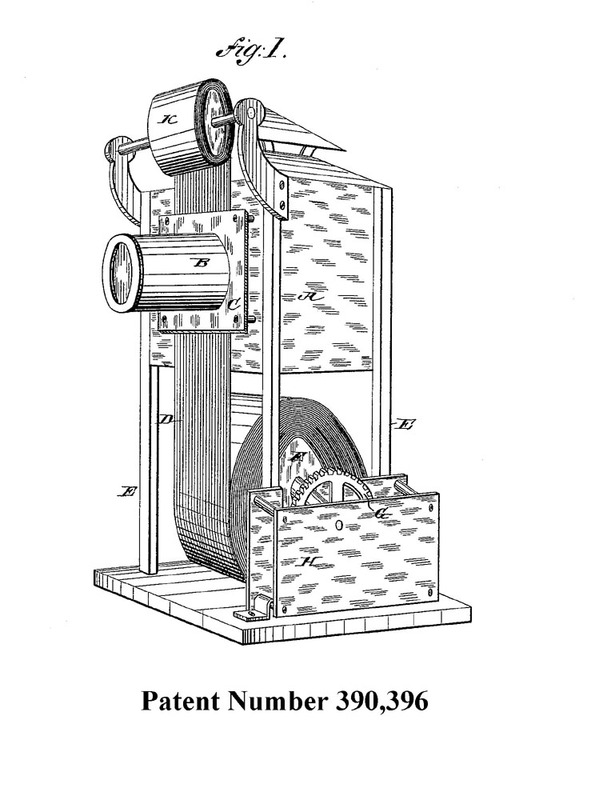 Patent Number 357,114 In 1887, Daniel A. A. Buck of Cheshire, Connecticut was awarded a patent for a portable camera, in which the bellows folded up into a small leather covered camera box or hand satchel. Allan Cameron Sargent of Graniteville, Massachusetts improved upon the concept with patent (Number 360,249), that allowed the bellows and the lens to fold up within a rectangular wooden camera box. John Ripley Freeman of Lawrence, Massachusetts, improved upon the concept with a patent (Number 365,435) which dramatically reduced the thickness of the camera box and integrated the camera with a tripod. 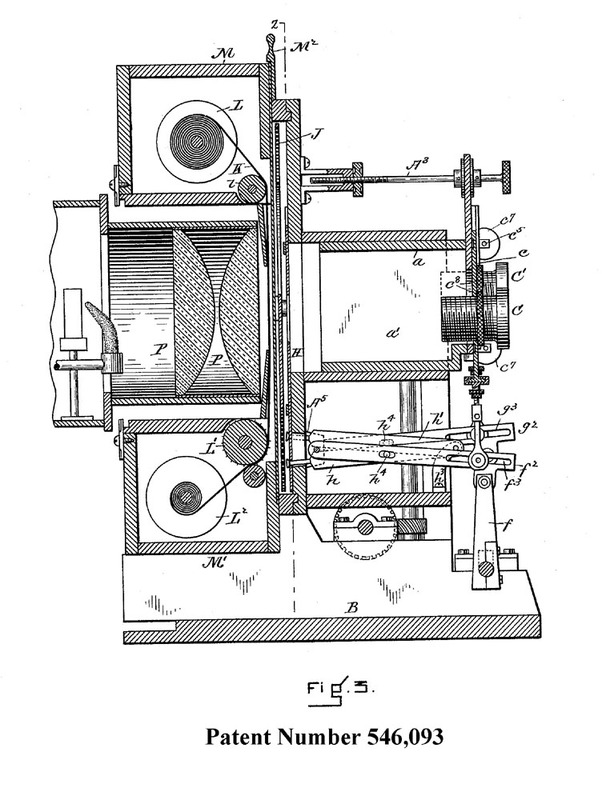 Patent Number 370,216 In 1887, Isaac H. Stoddard of New Haven, Connecticut was awarded a patent for a film cartridge. The cartridge held a roll of film and incorporated a friction-winding device. He assigned the patent to the Eastman Dry Plate and Film Company. Patent Number 382,735 In 1888, Theodore S. Rust of Meriden, Connecticut was awarded a patent for a multiple lens detective camera. He assigned rights to this patent to the Scovill Manufacturing Company. Patent Number 390,396 In 1888, Edward T. Potter of Newport, Rhode Island was awarded a patent for an early version of a film projector. A roll of film containing titling, photographs and other images were fed through a "dissolving view" magic lantern and projected onto a screen. Patent Number 399,499 In 1889, Alvan G. Clark of Cambridgeport, Massachusetts was awarded a patent for an advanced optic photographic lens. A pair of spherically ground concavo-convex lenses were mounted within both the front and the back of the photographic tube. The lens provided "flatness of field", depth of focus, and the absence of chromatic aberration or spherical distortion. Patent Number 415,566 In 1889, Frank Rowell of Boston, Massachusetts was awarded a patent for a method of coating photographic emulsion on rolls of celluloid or zylonite to produce flexible photographic negatives. Patent Number 422,825 Enoch Wood Perry, jr. of New York City and Emil Kipper, a German residing in Adams, Massachusetts collaborated on several patents (Numbers 420,355, 422,315, 422,804, 422,825, 424,315, 438,943, 438,944, 439,012, 439,013, 456,842, 458,907, 458,979, 458,980, 458,981, 463,705, and 492,696) for cameras, plate holders, and shutters. One of their patented inventions was an instantaneous shutter for photographic cameras that would let light enter the camera only during the interval of the exposure. This feature eliminated the requirement of covering the camera lens or inserting a slide in front of the plate holder while resetting the shutter. This invention was patent number 422,825 of 4 March 1890. Patent Number 439,121 In 1890, Newton Crane of Newton, Massachusetts was awarded a patent for a photographic camera that could take a 360-degree panorama view, also called cycloramic views. In this design the camera lens assembly would rotate completely around a roll of film. Patent Number 450,214 In 1891, Thomas Henry Blair of Boston and John H. Crowell of Vineyard Haven, Massachusetts were awarded a patent for a camera that used roll film. The camera incorporated a means of advancing the film by using a mechanism that cut notches in the film for each exposure. 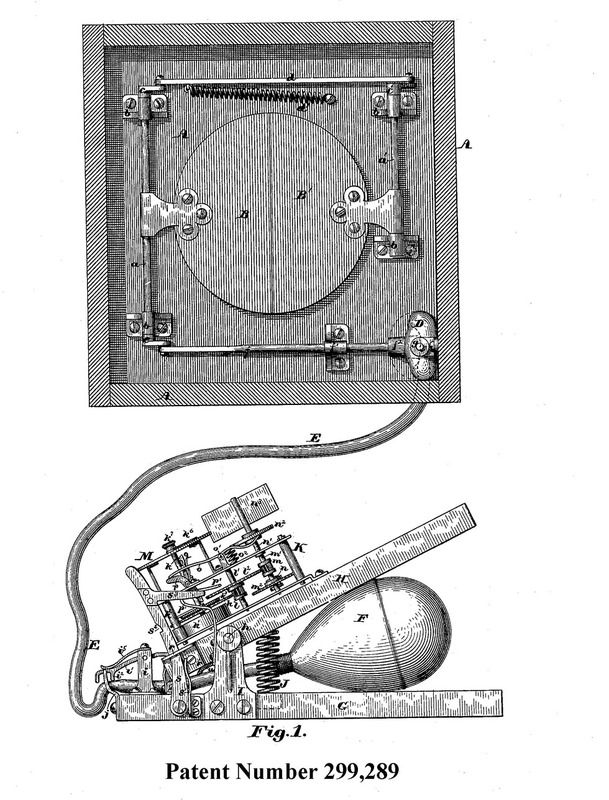 Patent Number 470,783 In 1892, Andrew B. Dobbs of New Haven, Connecticut was awarded a patent for an early spy camera. The camera was designed to appear as a pair of books when transported. He assigned rights to this patent to the Scovill & Adams Company in New York City. Patent Number 546,093 In 1895, Owen A. Eames of Boston, Massachusetts was awarded a patent for an invention he referred to as a "camera-lantern". This device was an early motion picture projector. Patent Number 572,718 In 1896, Henry E. Rathbun and Frederick Bebby of Pawtucket, Rhode Island were awarded a patent for synchronizing the camera shutter to a flash attachment (flash-light). The invention utilized an electric current to ignite the flashing powder. Patent Number 583,956 In 1897, Elihu Thomson of Swampscott, Massachusetts was awarded a patent for producing stereoscopic x-rays. The stereoscopes were produced from two plates by shifting the source of radiation (Roentgen rays). The invention provided the surgeon with a three-dimensional view of internal anatomy. He assigned this invention to the General Electric Company in New York. Patent Number 584,550 In 1897, John Jacobson of Boston, Massachusetts was awarded a patent for producing a medallion from a photograph. The invention used a swelled-gelatin process on an exposed photographic plate to form a low-relief mold. This mold was then worked by hand into a high relief mold and then cast into a medallion. Patent Number 622,955 In 1899, Frederick H. Kelley of Providence, Rhode Island was awarded a patent for integrating an f-stop into a photographic shutter. He assigned this invention to the Eastman Kodak Company. Patent Numbers 624,042 and 624,043 In 1899, John Jacobson of Boston, Massachusetts was awarded two patents for producing three-dimensional photographs. In this process, the left and right negatives from a stereoscopic camera are separated into a series of thin strips. The left images are alternated with the right images in the assembled photograph print. The photograph print was then mounted on the backside of a transparent plate, which was cut with as series of zigzag grooves. This assembled photograph provides a relief effect similar to a stereoscope. He assigned this invention to James F. Dorsey of Winchester, Massachusetts. 1. The Camera and the Pencil; or the Heliographic Art, its Theory and Practice in all its various Branches; (e.g.- Daguerreotypy, Photography, &c.); Together with its History in the United States and in Europe; being at once a Theoretical and a Practical Treatise, and designed alike, as a Text-Book and a Hand-Book, by M. A. Root, published by J. B. Lippincott & Co., Philadelphia, 1864. 2. The History and Practice of the Art of Photography; or the Production of Pictures through the Agency of Light, by Henry H. Snelling, Published by G.P. Putnam, New York, 1849. 3. Boston Daily Evening Transcript of 3 June 1852. Researching U.S. Patent books is a very laborious task, but is important and very rewarding because it unlocks the history and chronology of early photographic inventions. As I reside a significant distance from the nearest large city containing archives of U.S. patents, I thought this research would have to wait until my hair turned silver and I retired. Almost by accident, I stumbled onto the on-line database of U.S. patents. The rest is history. In recent years, all U.S. Patents have been scanned and placed in a retrievable database. The United States Patent and Trademark Office maintains this database at http://www.uspt.gov/patft/index.html. The database has some drawbacks and some advantages. In the area of drawbacks, search fields are very constrained with regard to early patents. The patents are not retrievable by inventor, or by state, or even by year. But they are retrievable by ccl code and by subclass. The term ccl is an abbreviation of Current U.S. Classification. The classification scheme is the way the Patent Office compartmentalizes the wide range of U.S. patents. The various classification titles are described at http://www.uspto.gov/go/classification/selectnumwithtitle.htm. In the area of advantages, the scanned patent files are stored with sufficient resolution to provide fine details in the patent drawings. These files are stored as TIFF files. As a resu lt, when the files are printed using a laserjet printer, they produce a good quality print. I began my research by using the advance search option at http://patft.uspto.gov/netahtml/search.adv.htm I performed my initial search by extracting all the patents with a ccl of 396 (Photography). After I completed this search (which took several months to perform), I sent the results to other photographic researchers: Ron Polito (Massachusetts) and Dave Tinder (Michigan). I was a little naive at the beginning and thought all photographic patents could be found in one spot. The feedback I received, indicated that my initial search failed to pick-up a substantial number of patents. So it was back to the drawing board. Both Ron and Dave gave me lists of these missed patents. I took these patent numbers and performed a reverse search to locate additional "ccl" and "subclass". For example, a ccl of 040 deals with patents under the heading "Card, Picture or Sign Exhibiting". Within this class is a subclass of 124.5 that deals with markers such as gravestones. Mixed in this breakout are some patents that deal with photograph mounting on tombstones. In my next step, I took the lists of patent numbers and using a reverse search identified new ccls and their subclasses. This search picked up the following photographic patents: ccl 040 (subclass 124.5, 363, 530, 537, 671, 701, 703, 706, 709, 710, 714, 715, 718, 720, 721, 722, 737, 743, 747, 768, 770, 771, 772, 774, 775, 776, 777, 779, 790, 791, 792, 793, 795, 797, 798, 800), ccl 101 (subclass 463.1), ccl 108 (subclass 5), ccl 134 (subclass 153, 157), ccl 217 (subclass 5, 7, 56), ccl 226 (subclass 118.1), ccl 248 (subclass 118, 404, 411, 572), ccl 269 (subclass 87.1, 87.3, 254D, 254MW), ccl 297 (subclass 353, 411.27), ccl 352 (all subclasses), ccl 353 (all subclasses), ccl 355 (all subclasses), ccl 359 (subclass 467, 468, 476), ccl 399 (all subclasses), ccl 428 (subclass 13, 199, 210), ccl 430 (subclass 269, 272.1, 274.1, 289.1, 302, 309, 464, 525, 641), ccl 431 (subclass 363, 364, 365), ccl 451 (subclass 414), ccl 472 (subclass 77), ccl D16 (all subclasses). I cannot guarantee that the second search picked up all remaining photographic patents. There are probably a few that are still buried like needles in a haystack. But these two searches did find the majority of photographic patents. One of the problems which I encountered during my research is where do I draw the line. For example, does lithography fit under photographic patents? Does photolithography fit under these patents? Do I include moving pictures? What about X-Rays? I had to decide on a case-by-case basis. I hope I arrived at the proper balance. Rather than focus solely on patents from one state or region, I allowed my search to include patents from across the entire U.S and even foreign countries. I extracted and printed all of these approximately 2,500 patents. These I have filed away by patent number. I constructed a database in a Table in Microsoft Excel with the following fields: Name of Inventor, City, State (Country), Patent Number, Patent Date, Description, and Assignor. For this article, I sorted and extracted a listing of approximately 330 photographic patents from New England.